Sarah “Sally” White was born about 1805 in South Carolina. It is not currently known who her parents were. Some people have listed her parents as Hiram and Tabitha King White but since they would have only been about ten at the time of her birth, that seems unlikely. Little is known of her outside of her marriage certificate showing her marriage to Jacob Sanford on July 4, 1824 in Tuscaloosa County, Alabama,and the 1850 and 1860 census records from Fayette County, Alabama and Tuscaloosa County, Alabama, respectively. Unfortunately little information was provided in those early census records – only her name, general age and birth location. Her known children were my great-great-grandfather, Asa (1826), Tabitha Caroline (1828), John Rufus (1832), Martha (1833), Larkin L (1834), and Absalom (1837). Where there are gaps in birth years, there may have been other children as yet unidentified. No specific birth or death date records have been located and no burial information is available. Her death prior to 1869 is assumed based on her husband’s second marriage about 1869. Since many of the people in her immediate family are buried at the El Bethel (Buncomb) Methodist Church Cemetery in Tuscaloosa County, it seems likely she is buried there. 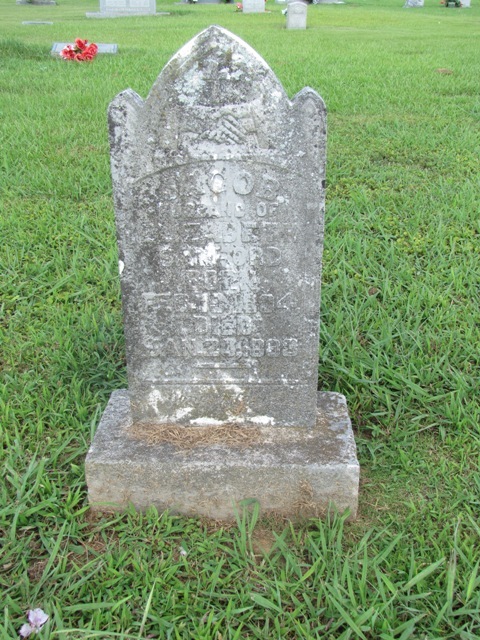 Jacob Thomas Sanford, my third great-grandfather, was the son of Absalom Abraham B. Sanford and Sarah Catherine Snider. He was born February 19, 1804 in South Carolina; some researches show his birth in Lexington District but I have not yet seen documentation to verify that. Family tradition states several families including a number of Sanfords moved from South Carolina to Alabama about 1819. Although I have not been able to find any census records on Jacob or his father for the 1820, 1830 and 1840 censuses, all later census records for Jacob’s children list their births in Alabama beginning with Asa’s in 1825. 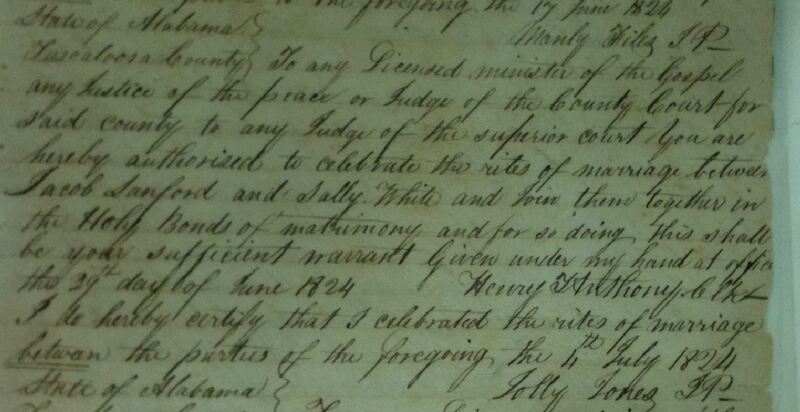 On a trip to Alabama in 2010, my daughter and I went to the Tuscaloosa County Courthouse where we found the filed record of Jacob’s marriage to Sally [Sarah] White, which took place on July 4, 1824. The 1850 census lists John and Sarah/Sally and their last three children, John Rufus (18), Larkin L. (15) and Absalom (13). The census identifies Jacob’s occupation as a hatter. Although I have not yet been able to discover very much about his occupation, I know from multiple census records and from conversations with Sanford descendants that this was a family business. They apparently made felt hats in a bowler style with a fairly wide brim. I have been told there is a photo of several of the Sanford men in front of the hat store each wearing a hat made by them in addition to a photo of one of their hats in one of the editions of the Heritage of Fayette County book; I have not been to get copies of either of the photos so far. In looking at the occupation of hatter, some interesting pieces of information surfaced. The Mad Hatter from Lewis Carroll’s Alice in Wonderland is at least partially based on an historical medical result of making felt hats. To make felt, fur was first treated with a solution of nitrate of mercury. Working inside in poorly ventilated workshops could and did result in mercury poisoning. Symptoms of mercury poisoning include emotional instability, cognitive and memory loss, shyness, speech problems, a lack of muscular coordination and sensitivity to touch. Since most census records were inconsistent in listing their occupations as either hatters or farmers, perhaps they were outdoors in the fresh air enough to at least somewhat counteract any long-term effects of the mercury. Jacob’s wife, Sally, died sometime before 1869. They had six known children: in addition to those listed in the 1850 census there were Asa [my great-great-grandfather] (1825), Tabitha Caroline (1828), and Martha (1833). Jacob married Elizabeth Taylor in 1869 when Jacob was 61 and Elizabeth was 20; they had five more children: Willis Henry (1870), Harmon A. (1872), John William (1874), Mary Ann (1876) and Sarah Katherine (1878). He died January 20, 1883 and is buried at El Bethel (Buncomb) Methodist Cemetery in Tuscaloosa County, Alabama.